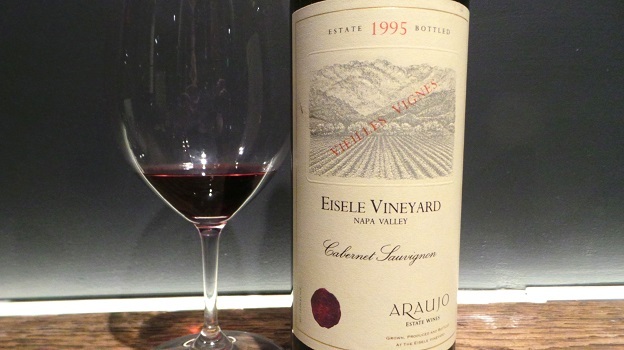 What a treat it is to taste and drink Araujo’s 1995 Cabernet Sauvignon Eisele Vineyard Vieilles Vignes. A wine of seamless texture and balance, the 1995 captivates all the senses with its exhilarating purity and total finesse. The flavors are bright, nuanced and layered in a wine that is peaking today but still has another decade-plus of fabulous drinking ahead of it. Araujo has long stood for a contemporary sense of classicism, and that is exactly what comes through here. First produced in 1991, the Vieilles Vignes was made from Block 3, the estate’s oldest vines of head-trained Eisele clone Cabernet Sauvignon planted in 1964 on St. George rootstock. Block 3 was the source of the 1971 Ridge, 1964 Conn Creek and 1975 Joseph Phelps Eisele Cabernets, all iconic, benchmark wines for the property and Napa Valley. Araujo made just one barrel of the Vieilles Vignes each year until 1998, when the vines finally succumbed to leaf roll virus. At the time, the rest of the fruit off Block 3 went into the Estate Cabernet Sauvignon bottling. The Vieilles Vignes was always 100% Cabernet Sauvignon and was not released commercially, but mostly given as gifts. Readers fortunate enough to own the 1995 are in for a real treat. What a spectacular Cabernet Sauvignon this is. Winemaker Françoise Peschon did a phenomenal job with the 1995 VV in just her third harvest at Araujo. 98/Drinking window: 2014-2025.